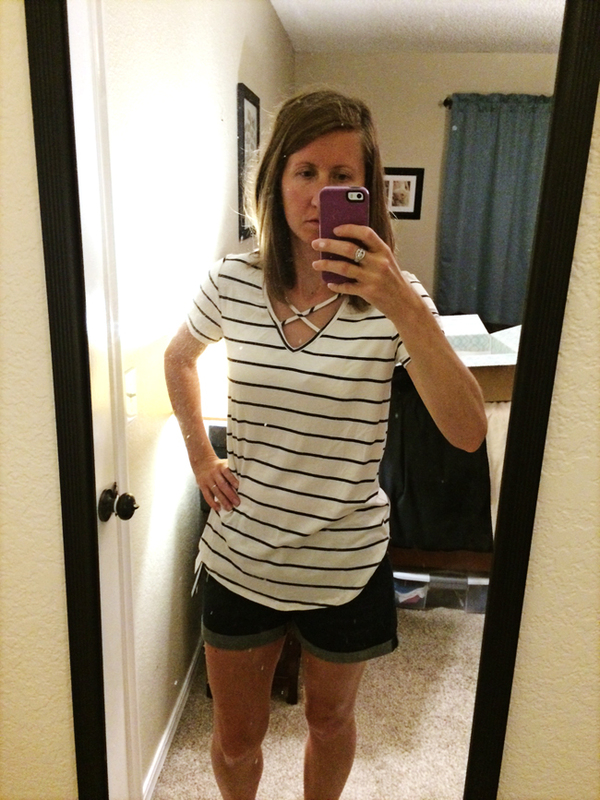 Last week I received my third Stitch Fix box, and it was another great one! All the pieces were completely my style, although I ended up only keeping two things. I am so far 3 for 3 with great boxes! I also appreciated the prices of the items. Everything minus the maxi dress at the bottom was $38 or under! Just a reminder you can try out your first box for free using my referral code. You will only pay for any clothes you keep, and you can cancel after that if you don't like it! I'm going to show you what I got, but first a disclaimer. I took these pictures quickly in the morning before I got kids up. It's dark in our bedroom, and R colored with crayon all over the bottom of my mirror. Fashion blogger, I am not. I also need to clean more. Now, then. Here's what I got in my box! The back of this shirt is really fun, but it didn't wow me from the front with just plain gray. I felt like it was just a tad too short and kind of see-through. Return. The first thing Jordan did when he saw me wearing this shirt was ask me if I had it on backward. Hi, no. I love this one and actually wore it to work on Friday. For some reason right now I can't get enough stripes in my closet. Just give them all to me! The cross top adds a fun element, and it is light and airy for summer in Oklahoma. Keep! *No individual photo, but I am wearing these in the above two pictures. These were super cute but a size too big, which I'm not complaining about! Rather too big than too small, am I right? Stitch Fix does have an exchange option, and I considered sizing down, but I couldn't guarantee I would love the fit, and for the price ($28) I could probably find a pair of shorts at the outlet mall I liked equally well. Return. When I tried this on, I loved it immediately and thought for sure I would keep it. It's a gorgeous blue, super soft, silky material, and fit perfectly. This picture is clearly terrible and shows you nothing, so don't judge a skirt by a dark bedroom photo. But I ended up returning it for two reasons: one, I have a black and a lighter blue maxi skirt, so I didn't need another skirt in that color block. The second reason is because I surprised myself and kept the next item, a maxi dress. I wasn't feeling like spending more money on this skirt. Return. *This photo does the dress zero justice. I really don't even know why I'm posting it. Also I know I can't wear this bra with this dress. Again, I was on a time crunch! Some of you might have voted in my Instagram poll. I asked whether or not this dress was cute or weird, and 81% said cute! Also Jordan said I looked great, so that tipped the scales ;) This is a much fancier and cuter dress than it looks in the photo, and I'm planning on wearing it to a wedding we have at the end of the month for good friends of ours. Jordan is actually one of the groomsmen. It's a lovely dark green, which is a color that looks really good on me! My hesitation was the tie at the top. I still don't totally understand how to wear it or what the point is, but I also think it's kind of fun and unlike anything I would choose for myself. Keep! What do you think of my box this time? What would you have kept? 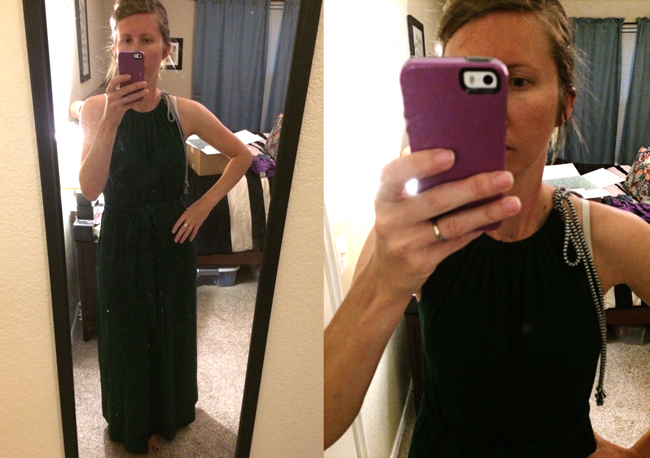 What are your feelings about the shoulder tie on my maxi dress? p.s. Here's my referral code if you want to try out Stitch Fix for yourself! I love the striped shirt and totally would have kept that! And the shorts, but I have sprinter quads and some extra pounds, so I tend to buy a size or two up on shorts. Anything tighter on me looks weird. I love the maxi, and I think the tie gives it a little extra bit of detail, although I haven't a clue as to how you're supposed to wear it. All in all, great box! I've been trying Stitch Fix the past few months and asked my stylist to give me some inexpensive maternity wear that I can probably use after baby emerges, and she's found me some great transition wear! I'm a fan. I love stripes too, all the time! I kind of think the same thing about those shirts, that they look backwards, but they are cute! I am ready for my next fix next month! I hope you have a good box coming your way! Great box and it's nice to see that they offer affordable options! A few bloggers I follow have SUPER expensive items all the time. YIKES! I agree! Some of the things are SO expensive. You can put a preferred price range, though, and this one especially felt pretty good to me! The striped shirt looks great on you! The maxi does, too. I'm glad you kept it. I definitely understand your reasons for returning the skirt, but it did look super cute and comfy! Thank you! 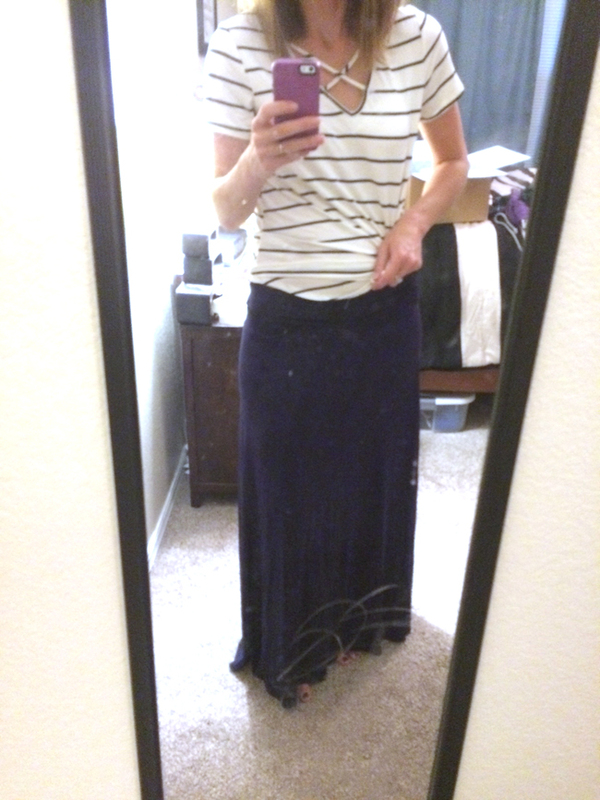 The skirt was very comfy, but I am trying to keep it minimal and I already have a few that are similar. My closet is mostly in shades of black, navy....and stripe lol. So I am obsessed with that striped top you got! Love it! That dress is cute on you too, I like the tie sleeve detail. I love stripes! Can't get enough. I am loving that maxi dress!!! It's so cute! Thank you! It looks even better in good lighting haha! No one can ever have too many striped shirts. That's what I tell myself at least! 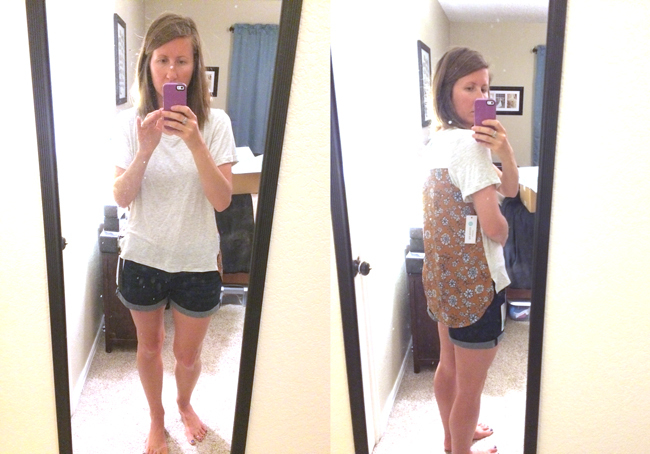 Glad you are loving Stitch Fix! I got away from it when I was pregnant the first time and didn't want to keep buying stuff but it's so fun!! It's been really fun so far. I've had the same stylist for all 3 boxes and she has done a great job with my style! wow, $38 or under? that's awesome! those shorts are super cute. i have a really hard time with shorts because of my shape, finally found a pair i like a lot from tj maxx and they were $30, ugh. but i've been searching a long time so i just did it. that dress is gorgeous! glad you kept it. you make me want to do another stitch fix, it's been a looooong time. I think the maxi dress looks great on you. I like the design on the back of the first shirt but not a fan of how plain it is in the front. Your photos of your Stitch Fix box aren't nearly as embarrassing as the ones from my last (and final) box. Crayon mirror and all! Good choices! I have so many black and white striped shirts and you really cannot have too many. The green dress is gorgeous and the one thing I loved about Stitch Fix is that some of their clothes have something unique about them that sets them apart from the clothes I normally buy in big box stores...hence the tie on the side. I think how you are wearing it is perfect! Those Stitch Fix people are keeping you very trendy and in-style. I have been seeing a lot of people with the criss-cross across the neckline. I approve. How much was the maxi dress ?